Jennifer B. Kahnweiler, Ph.D., Certified Speaking Professional, is a best-selling author and global keynote speaker who is known as the “Champion of Introverts.” In addition to her latest book, The Genius of Opposites, she has written two best-selling books about introverts (Quiet Influence and The Introverted Leader), which have been translated into 14 languages. Jennifer has worked with hundreds of organizations including GE, CNN, NASA and the CDC. She is a highly regarded faculty member of the American Management Association and has been featured in Forbes, Time Magazine, Fortune and The Wall Street Journal. Jennifer’s commitment to introverts started the day she married one. Since then, she’s helped organizations value the introverts on their teams and coached introverted individuals to step confidently into leadership positions. 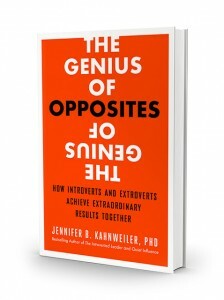 Jennifer Kahnweiler considered herself a “flaming extrovert”, but focused on introverts in her career. She became saddened seeing talented introverts constantly passed over for promotions and opportunities. Her latest book has advice on how extroverts can achieve professional harmony with introverts and vice versa. She also highlights the skills that introverts bring to the table, such as preparation. For tense opposite partnerships, or even ones that just need a bit of guidance, she has created a quiz to help opposite pairs identify key issues. It is particularly valuable to metric-minded individuals. The quiz also serves to take some of the burden off of the introvert, who may be wrestling with how to communicate their concerns. Introverts find many times that their workplace culture is difficult to navigate, due to their strengths being encouraged during hiring, but ignored in the job. Jennifer’s solutions come from the observations that she used to write her books. She mentions how the most successful pairs make a point to get along, share the credit, and complement each other. She mentions her five main concepts for getting the best out of an opposite partnership. She also mentions the importance that conflict has in an opposite pairing and how it can cause it to thrive. Being too polite can destroy the opposite pairing dynamic that’s so important. Jennifer’s body of work proves that you can thrive in an opposite pairing by staying true to who you are. *Amazon links are affiliate, meaning I receive a few pennies (at when you purchase through my link. You get some retail therapy, I get additional resources to keep bringing you great podcasts. Win-Win!! The whole podcast was well worth listening to, but I have to say that the highlight for me was the tip at the end. The tetris image was so apt! I often feel like this when I am with my more talkative friends and acquaintances. You helped me understand why I get so exhausted trying to keep up, or worse, trying to slow down the onslaught to my pace. Here’s my own image, inspired by your tip. You may remember many years ago when one of the top finishers in the NYC marathon turned out to have used the subway for part of the route — horrible cheating, right? But I’m going to give myself permission to “cheat” in conversation — to not try to keep up with the marathon talker, but simply drop out of the race, and take the easy route to intercept him or her at some point, without worrying so much about what happens along the way. The truth is, I will never be able to run that particular marathon, and I should stop trying! I love your image of a marathon and taking breaks. Many extroverts actually don’t expect introverts to listen to all their words intently so solution and Beth’s work for all concerned! Thanks for sharing.